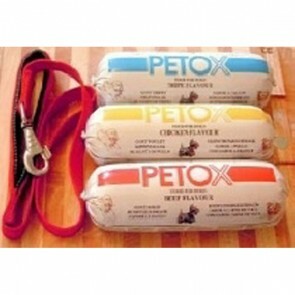 Petox Chubs offer excellant value for money incomparison to most tinned foods. Packed for convenience in a plastic sleeve, Petox Chubs can be stored at ambient temperature until opened and then must be refrigerated. Chubs are ideal for dogs that prefer a combination of moist and dry food, that we recommend you use with a dog food mixer available on this website. Chubs: 5 stars out of 5 based on 0 user reviews.